Aliou Cisse's Senegal have already qualified for the 2019 Africa Cup of Nations in Egypt. 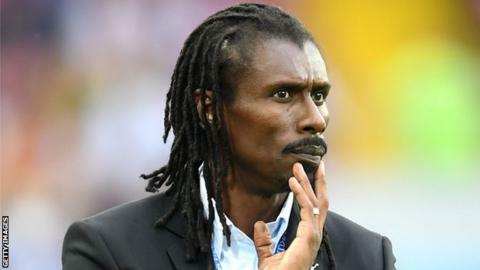 Senegal coach Aliou Cisse handed debut squad call-ups to four players ahead of the forthcoming 2019 Africa Cup of Nations qualifier against Madagascar and the friendly with Mali. The Teranga Lions, who are already through to the 2019 Nations Cup finals, will host already-qualified Madagascar on 23 March before playing Mali three days later in Thies. Goalkeeper Dialy Kobaly Ndiaye is rewarded for his impressive performance at the recent Under 20 Africa Cup of Nations in Niger. The 19-year-old Cayor Foot player conceded just two goals at the tournament - with three clean sheets - to help Senegal finish second behind Mali, and is thrilled to be part of Cisse's set-up. "It's a pleasure, as a young player to join the national team so early. It's a dream come true. I would also say one more experience for my career." Ndiaye told local media. Krepin Diatta, Sada Thioub and Mamadou Loum Ndiaye are also called up for the first time. Club Bruges forward Diatta, also 19-years-old, is included after recently being named on the standby list for the match against Sudan. The former Sarpsborg starlet represented his country at U-20 level helping Senegal finish second at the 2017 U-20 Africa Cup of Nations in Zambia and the knockout stage of the Fifa U-20 World Cup. FC Porto's new signing Mamadou Loum Ndiaye was part of the Senegal squad that finished fourth at the 2015 Fifa U-20 World Cup in New Zealand. France based striker Sada Thioub will compete with established forwards Mbaye Niang, Moussa Konate and Mbaye Diagne for a place in Cisse's team. The 23-year-old is on the books of Nimes where he has featured 27 times this season, scoring three goals and setting up three assists. Star players Sadio Mane, Idrisa Gana Gueye, Keita Balde and Ismaila Sarr have also been named in the 25-man squad, which was released on Wednesday in Dakar. Senegal have a three-point lead over Madagascar going into the final group match in 2019 Nations Cup qualifying, but Cisse wants to finish on a high in front of their home fans. "Our objective is to top the group and give our players the chance to stake their claim for a place in the national team," Cisse said.